Owen Taylor was born in Golborne, Lancashire, circa 1888, the son of Robert & Hannah Maria Taylor (nee Jones) who I believe had married in the registration District of Leigh, Lancashire in the June quarter of 1884 (Leigh Vol. 8c, Page 268). Owen’s parents had both been born in Flintshire, Robert in Llanasa and Hannah Maria in Holywell. Work had taken both families to Lancashire, and they may have met and married there, but they often returned home as Robert’s family of Taylors had a connection, at one time to Picton Farm and they were still there in the 1920’s probably that is why Owen’s name was put forward to both Llanasa and Picton War Memorials. Owen first appears on the 1891 census, living at 35, Cross Street, Golborne, Lancashire, his father Robert, 30, was head of the household and a Coalminer, had been born in Wales, as had his wife Annie M.,26. Their children, Mary E. 5, Owen, 3, and Annie D., 1 had all been born in Golborne, Lancashire. By the 1901 census the whole family were living at Pen y waen, Llanasa, Flintshire and all the family were bilingual. Robert, 40 was now a Lead Miner, his wife Hannah Maria (Myiar on the census!) was age 36. The family had grown, Mary Elizabeth, 15, Owen, 13 and Annie Dorothy, 11 had been born in Lancashire, William, 7, Ellen Jane, 6 and Mria (sic) Alice, 2 had been born in Llanasa. 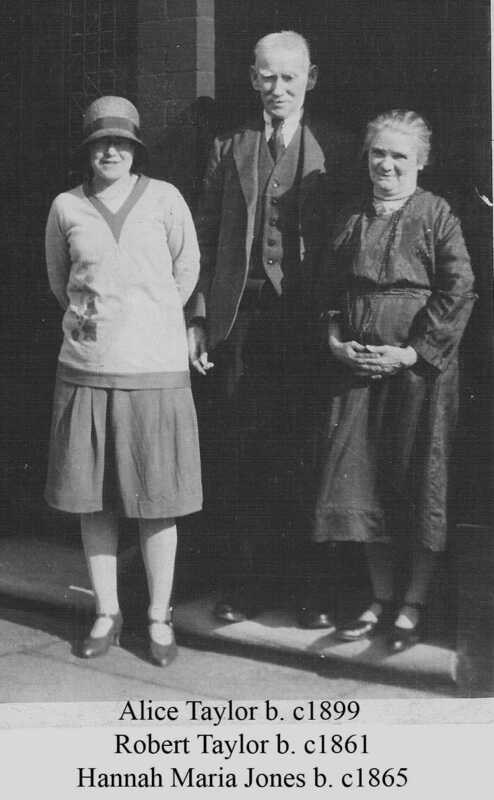 By the 1911 census the family were back in Manchester, probably for work, and thanks to Margaret Grimsditch (nee Taylor), I now know that they were living at 28 Gibson Street, Harpurhey, Manchester. Robert, 51 was now a Builder’s Labourer and Hannah M., was 47 and they tell us that they had been married for 27 years and 3 children had been born to them, but I think they misunderstood the question, perhaps thinking it was to say how many children were in the house, as they obviously had more as can be seen by the censuses. Owen, 23, was single and a Grocer, William, 18 was a “Labourer in the Plastering Bus.,” and on this census he and Owen had been born in Golborne, Lancashire. Maria Alice, 12 was at school and on this census, had been born in Mold, Flintshire, as had her parents Robert & Hannah. Margaret has been able to fill in gaps in Owen’s story, so many thanks to her for that but also for the photographs that she has kindly allowed me to add to the website and add to his story. 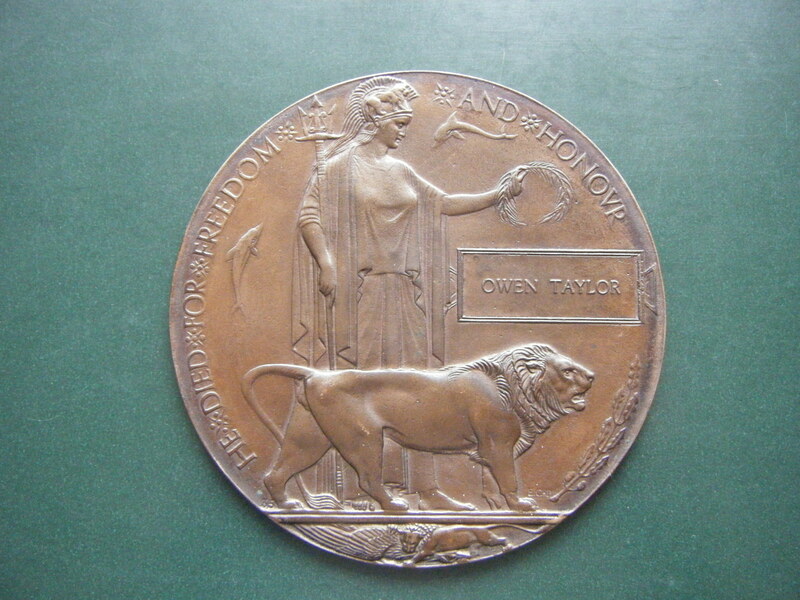 I cannot find any Attestation Papers for Owen, but on Ancestry – Owen Taylor in the UK, Soldiers Died in the Great War, 1914-1919, confirms his regimental details above and his birth in Golborne, Lancashire and his residence in Moston, Manchester, also that he enlisted in Ashton-under-Lyne, Lancashire. In the UK, Army Registers of Soldiers’ Effects, 1901-1929, his name wrongly transcribed as Orien (sic) Taylor and tells us that the Sole Legatee was his mother Hannah M. who received £1 13s 7d on the 25th October 1917 and his War Gratuity of £ 3 on the 25th November 1919. Owen Taylor in the British Army WWI Medal Rolls Index Cards, 1914-1920 does not tell us his first Theatre of War nor when he entered it. This is the Will that soldiers made out before they went into battle. At the time of Owen’s death the family had moved to 42 Princess Street, Moston, Manchester. There was an altar chair dedicated to Owen’s memory in the Welsh Chapel on Church Lane, Harpurhey, Manchester. This was given to Margaret’s family when the chapel closed but sadly it was stolen in a house burglary and its whereabouts is now unknown. The battalion remained at La Kreale training until the 31st May 1917, when it entrained at Caestre for St. Omer moving thence by bus to billet at Acquin. The 16th was now bound for Ypres area, and left Acquin on June 6th, by bus, for billets near Hielehoeux, to the west of Poperinghe, where it was held in reserve for General Plumer’s successful attack on Messines Ridge. It was here until the 9th, when it marched to Toronto camp, providing working parties there until it is relieved by the 2nd Yorks in the trench in the Hooge Sector (14th – 20th June). This was one of the worst trench sectors the battalion had experienced and there were over 50 casualties. 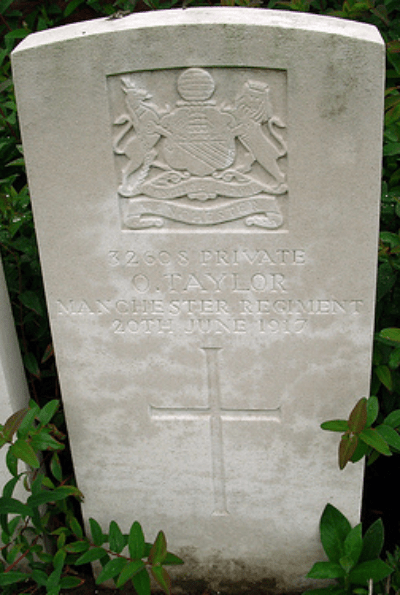 Owen Taylor was probably one of those casualties as his death is recorded as 20th June 1917. Owen, as said before, is also remembered on the Llanasa War Memorial, he must have been well loved.